I am a little overwhelmed and very appreciative – I’ve been nominated for a number of great blogging awards over the past months. I wanted to do the acceptance posts properly, so I’ve been pitifully slow about it. I apologize. It took me a little time to select appropriate nominees – but now I’m ready! My sincere thanks to the the following kind souls for their nominations: Pat Bailey at I Miss Me, Too (One Lovely Blog Award), both CanadianTravelBugs and Cyberbonnn at Just Cats (Beautiful Blogger Award), LubbyGirl at REmissionary (Very Inspiring Blogger Award), and FirstandFabulous (Gemma) at Dear Bliary (No Strings Attached/Gratitude Award). I appreciate the thoughtfulness of each of these interesting bloggers – Please visit them at the links provided above to see why they also received these awards! I accept awards because it makes me happy, but also because the acceptance process does something that’s important, especially for newer bloggers: It shares information about interesting blogs, and helps us get to know one another. Thank the blogger who nominated you and share a link to that blog – Done! Attach the award icon to your site – Done! Share seven random things about yourself: I’m getting braver about writing; I love being on the water; I’m a terrible procrastinator; I want a new digital SLR camera; I’m a real klutz; I like loading the dishwasher but hate unloading it; I’m married to a twin. http://sharechair.wordpress.com/awards// inspiring us to learn new technology and more! This one I’m sending out to some bloggers who maintain great sites of their own, but always take time to visit and comment on other bloggers’ posts. They (among others) have supported and encouraged me regularly. No strings on accepting this one, folks! http://firstandfabulous.wordpress.com/about/ – Right back atcha, Gemma! I hope, whether or not these bloggers opt to accept their nominations, that you will choose to visit some or all of them, and perhaps connect with a new kindred spirit or two along the way! I am somewhat embarrassed to say that while I dithered over these, I have received a couple of new nominations. To those kind folks: I haven’t forgotten you; I am working on my acceptance post now. In the meantime, thanks so much for putting up with me and reading all the way to the bottom – Like most acceptance “speeches,” this ran too long! Maybe I should create a Patient Reader Award!! This entry was posted in Blogging, Giving Back, Ruminations and tagged Beautiful Blogger Award, blogging, Blogging Awards, Blogging Community, Gratitude, Gratitude Award, One Lovely Blog Award, Very Inspiring Blogger Award. Bookmark the permalink. Congratulations! Thanks for sharing the award. Truly inspiring in everyday. Wishing you an amazing 2013! Whew! I admire the work that went into your post! here’s half of mine, with the other half coming tomorrow! Thank you for your award. I’ve finally made a modest speech. Let’s keep up blogging! Thank you again for your great company. I was just looking in my spam folder (don’t really know why) and found your nomination of my blog for an award. Thanks heaps! I’ve retrieved the message and will think about my answers to your questions. Perhaps I shouldn’t ignore the spam folder, though I thought I was supposed to. Congratulations on your well deserved awards!! Thank you so much for including my blog. I really appreciate it! Thank you so much for the nomination and congrats on yours! I know it takes time to accept nominations and choose blogs to reciprocate, and you’ve set a wonderful example. Hopefully I will follow your lead! Honor to whom honor is due! Congratulations on all your awards. Thank you so much for nominating me. I bow in gratitude. Thank you for the kind thoughts and nomination, aw shucks, it’s very kind of you. Congratulations on all your awards! Congratulations. You have a very inspiring blog with so much to offer. Thanks for sharing the award. It’s a joy and an honor my friend. Congratulations, TRS, and thank you for the award. I’m honored. I just now saw the nomination! It’s my first, so I’m very excited! 🙂 What a lovely compliment from someone who has received so much recognition herself. Thank you so much! I haven’t had a lot of time to post or read lately, but I promise to set aside some time to check out the other bloggers you recommended and find more people to nominate myself. I’m looking forward to some good reading and photo browsing! Thanks again and congratulations to you! Thank you for nominating me for the One Lovely Blog Award! There are a couple of other awards that I’ve been nominated for that I haven’t quite got around to writing up yet (and feel guilty about! ), so I think I’ll be doing the same as you and doing them all in one go at some point soon. Thank you so much! I’m glad you’re enjoying my blog. Thanks for the mention and for the “back atcha”! Thanks for your kind comments – I’m happy you stopped by! I’m extremely honored that you’ve nominated my blog! I appreciate it greatly! You just made.my.DAY!!! I get to have my Saturday morning coffee and meet some new bloggers – and take my good sweet time doing it! Thank you so much for the nomination – I so much appreciate it. I couldn’t believe my eyes today when I read your comment on my blog. 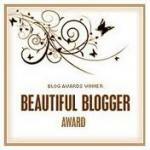 So thanks to nominate me for this ‘Beautiful Blogger’ award I ‘m honored to be among the chosen blogs. My congratulations on the awards to you as well. You really did a tremendous job on this one. You’re welcome – best of luck in your new location – please feel free to carry this award with you – I’ll be checking in! Make sure you leave a forwarding address post on the old account, if you haven’t already, so your followers can find you!! I’ll be happy to take the award with me, thanks, I’m working on it… . And the forwarding address to my new account is already mentioned on each of my old ones. Thanks for the tip. Congratulations! seems like you’ve put in a lot of thought and effort in to this post! Impressive! thanks so much for the nomination! They make me happy too 😉 I too have some that I need to reply to, hoping to find time soon. It’s nice to be recognized!! Thank you for nominating me….I am honored and overwhelmed! I must begin posting recipes again – this is the second award I get for recipes! I will pick the 7 nominees in a few days – takes some effort on who to pick because some of the bloggers around here have already won loads of awards. I wish I had more time to leave comments on other blogs but that might have to wait until I retire (hopefully I’ll have a job until then!). I’m with you on not having time until I retire to do all I would like to do with my blog, including visiting other blogs and commenting. For now, I sneak it in here and there. now I need to go visit your blog 😉 Happy blogging!! That is so awesome, TRS! Congratulations! It’s flattering to be on you nomination list. I’ll work on it. Happy weekend! Congratulations to you for recognition well-deserved. Additional thanks and gratitude for going the extra mile for others. I really appreciate it and will attempt to share your generosity in the future. Girlfriend! You put so much work into this post. 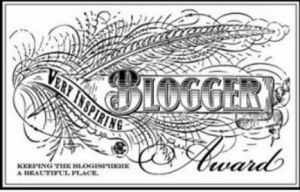 I am quite honored to be among the blogs chosen for an award. Thank you so very much! And what a wonderful resource of recommendations for visiting new blogs. Thank you! You’re welcome. I did this a very little bit at a time, adding new blogs to the post each week. I hope you find some of them interesting! Each award comes with a suggested number of nominees. The idea is to introduce bloggers to one another, although 15 does seem onerous sometimes. Thank you for the One Lovely Blog Award I will honour the award by visiting the other blogs you have suggested. May take a few days as have only just retruned from the UK and lots to catch up on! Awwww…you are so nice. How could anyone not pop in and visit. I will admit at times it gets hard when you actually want to have a life as well. But you must know that by now…hehehehe. I am thrilled you included me…especially in the ‘Here’s looking at you kid’ one. I am a crazy Bogie fan. Watched him last night while having dinner at a friends house – Casablanca – drooled ALL the way through. Both at Bogie and Ingrid’s clothing. Wow; this post represents a lot of organization and work! Congratulations, and great job! Wow, like the Oscars! Congratulations to you. Thanks for the generous nomination and good words about my photography.